Don't have Time Warner in my parts so this doesn't effect me any (it is nice to see that they're finally getting with the program and upgrading your connections though). I've had the option to switch to a 120M/12M connection for quite some time (for the same price that I pay for 20M/2M now) and I can even jump up to 250M/25M ($105.99 a month, not really in the cards if you ask me even though I would like to have it (I'd like to break into streaming games as a hobby and this connection would be best for it)). I've just been to lazy to call and upgrade my service (plus not having a job atm puts a strain on that as well) but with how my connection has been doing lately I'll probably upgrade to the 120 once I get a job. The last time I heard something different from TWC it was they were charging a leasing fee for my modem. Yeah, they're still charging about $10 a month I think in modem rental fees. I'm still contemplating buying my own modem from the authorized list to save that fee. Hmm.. I don't think I'll ever do alot of streaming. All my AFKing would probably lead to me having 0 followers. They're only doing it because they have to. Eventually Google Fiber is going to be more widely available and they'll have to compete with them or they'll go the way of dail-up. I hooked up my new modem today. I'm currently getting speeds of 94 Mbps download and 24.05 Mbps upload. Not bad, but thats through my wireless router and not directly connected to the Modem. I have a feeling my wireless router is showing it's limitations now. I still have to change some of my modem settings to bridge mode to not screw my router's NAT settings. 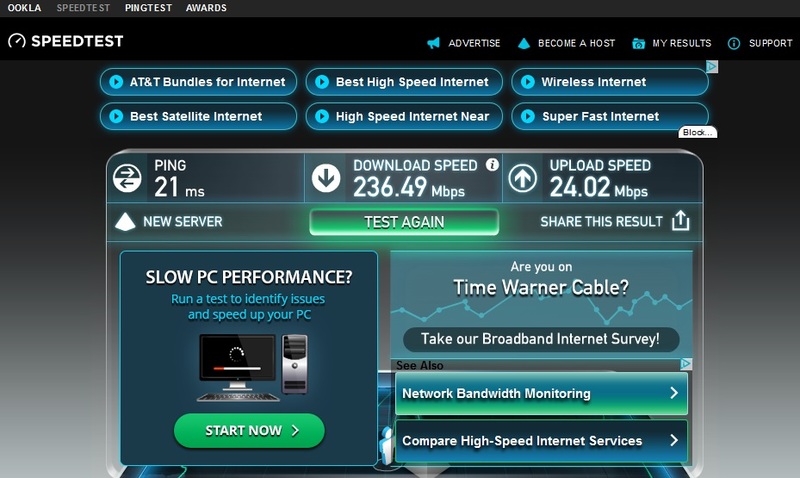 I might just plug my PC directly into the modem later and try the speed test thru it as a comparison. What kind of router do you have to suffer that much performance loss? I router is about 4-5 years old and I get maybe a 5-10mbps loss at best with 4 phones, 3 PCs, PS4, and a tablet running at once. My PC is furthest away from the router and that is what I am judging the loss off of. We only get 25mbps here, and I never dip below 15mbps on my PC and peak, but I do get 20-22mbps quite often. 24 up is crazy. They cap us at 3mbps here. With what I do on the internet, I never really notice unless the router goes screwy and needs to be reset because its only sending out .04mbps. Its a rare occurrence, but it only happens at inconvenient times. Unless it dips to 3mpbs I never really notice a difference since I use internet mostly for gaming. When I lived in an apartment, I had the cheapest comcast package that only gave me 8mbps. I have a cheap Belkin router, its supposed to do "150Mbps (for 2.4GHz), 300Mbps (for 5GHz)", but I've never had an internet connection faster than 30 Mbps before to actually test those numbers. According to Time Warner's site, I'm supposed to have a 200 Mbps connection now. Either the connection is only around 94 Mbps and my router isn't transferring fast, or my internet connection isn't no where near 200 Mbps and its actually about half that. Thats still a better connection that my one friend's DSL service. Hes just out of range of Time Warner and the best package he can get is 10 Mbps down and 1 (maybe) Mbps upload. And with Netflix HD usually needing 10 Mbps by itself, his internet is horrible. I still don't like the wifi strength of the Arris modem, so unless I buy a better wifi router to replace my existing belkin one, I'll just call up time warner and lower my package to save some money. I'm used to having only a 30 Mbps connection, and 200+ is just overkill for me right now. I forgot to mention, I changed my modem to "bridged mode" and my PS4 is having no problem whatsoever with NAT issues like what I mentioned in this topic. All those other settings like port forwarding, etc. are all pointless with NAT issues if using a separate modem and router. Just set that modem to bridge mode and all the NAT errors are resolved. Of course that doesn't help me with my speed situation. I could direct connect my main PC to the modem to get these insane speeds, but then my PC would have none of the protection of the router firewall, NAT, etc. because I still need my modem to be in bridged mode for my PS4 which is connecting wirelessly. Arris modem's wifi's signal is crap or I'd just use it. But its all good, I'll be lowering my internet plan to 100 Mbps anyway so it doesn't bother me. Wow, do you have a data cap? Ours is 450gb and $10 for every 50gb we go over. I can game all month without issue, but stream from Netflix we start getting notifications that were close half way through the billing cycle. Yeah it's relatively new here within the last year. We have comcast, mediacom, and AT&T. They monopolize by not competing with each other. So depending on where you live you can only get comcast or mediacom. AT&T serves anyone but it's because they are slow dsl. Thats some corporate greed right there. There would be not justification for Time Warner to put a cap in place at this point. They can't even use an excuse like "our network can only handle so much traffic". Thats obviously not the case since they're drastically increasing everyones speed at no extra cost. But with the price they charge for cable packages and internet, we've all been paying that cost for years now. Even Windstream's crappy DSL service here doesn't have a data cap. Exactly, they are using gas station tactics where they don't really compete, but they do have similar pricing. By not competing they can both place caps and charge for overages.... I don't get their buesiness model because it seems like they could make more by actually competing. When they build new subdivisions around here it can take more than 2 years to get internet service. I had a friend that moved into a neighborhood, and waited that long to get internet. AT&T has a complete monopoly on rural areas, and they charge as much as Media and Comcast does for 25mpbs packages for 3mpbs. Its either than or nothing. A few friends have it and its terrible... and if you try to use a booster they'll be able to tell and will throttle it within an hour or two. Holy crap. that is some horrible Internet there. And I thought my lack of options was bad. Meanwhile my dad in Ohio has 3 different cable broadband providers that he keeps switching between because each one keeps offering him new customer deals. He switches providers about once a year. It's kind of odd to. There's only the one cable line that goes to his house that's actually owned by time warner, but these other cable companies lease access to the network like how cricket wireless will use Verizon or AT&T's network. So even tho he changes providers, he only has to swap out the cable box and modem. Where I live that's not an option tho because time warner got exclusive provider rights with its network here in this town thru some shady back door deal as far as I know. Thats why I'm so ready for Fiber Optic services to beat the tar out of cable packages. I'm sure there will be BS caps and what not on them too once they make the current system as obsolete as dial up, but overall it will be better. They just approved the first hub in our state's capital so its probably years away... plus our city's government is as corrupt as it gets, it doesn't matter what party they belong too its all backdoor money in their pocket deals. You wouldn't believe it, but Disney World was originally scouting this city, but when the city officials found out they marked up the land costs super high... thats why when they decided on Orlando they bought up the land under fake names and shell companies. Jazz Land/Six Flags was suppose to be built here originally as well, and once again city officials priced themselves out of it and they went to New Orleans. I think Nasa looked here too before Cape Canaveral... but I have a hard time believing that since we get as much rain as Seattle. They'd never be able to launch anything out of here. Back when I used to play Sim City, I'd raise the tax rates like crazy and then speed up time to get more cash to play around with. Every time I did that the city turned to crap everything would turn into dilapidated buildings and infrastructure. Its a bit more f*cked up when you live in an area being taxed to death for so long that you actually see those same results over time in real life. I'm just glad I live in a small town instead of one of the larger cities. And I'm only talking about upstate NY. NY city isn't even part of this state in comparison to this region. Back on the subject of internet tho. We have Verizon Fios all over the place here (no data caps), but I'll never see it in my town because of that exclusivity crap Time Warner got. The thing that amazes me now is that my Time Warner connection is now faster than the fiber optic connection Verizon offers. Except for the upload. Verizon Fios internet has the same upload rate as the download. Their 100 Mbps connection is 100 Mbps upload too. I bet anyone that streams would love that. They could stream games in 4K with an upload rate like that. And that's what I'm hoping for. They have to give those speeds probably via the exclusivity deal. Otherwise someone could wisen up and sue the crap out of them for antitrust. If you deny the public competition you have to offer similar service. I guess the way AT&T gets away with it here is that Comcast and Mediacom don't want to spend money running cables out to low population and possibly low income areas because the returns wont equal out the costs of construction. I know the reps will tell people that move into a newly build neighborhood to get a petition going, and if so many people agree to sign up for service then they'll consider running cables out to them. Its not that they don't cater to big business here, they cater to them if they'll line their pockets. The property tax here is the lowest in the nation. I think if you double it we'd still be the lowest. People pay $400-600 for the entire year. The state overall has plenty of businesses like Austal, Northrop Grumman, Hyundai, and Honda. Its a right to work state so we haul in a ton of corporations. Its just our city itself that has greedy corrupt bastards that have let their stupidity ruin this city and help it fall well behind neighboring Pensacola and Biloxi. We have a Mayor now that is trying to modernize our city, but the city council makes sure to get in the way as much as possible. We have a lot of old people here too so none of them care about education or paying new taxes to help the city. We get to vote on just about every major state and city tax increase proposal and they always get shot down. In fact our neighboring county just had a vote to where it was made clear that if the tax proposal got voted down the school system would go bankrupt and have to shut down schools... yup it got voted down. The education system is in the dump and it gets treated like the federal government does social security. Its always the first thing to get cut or borrowed from but never gets new funding. What's sad is that the taxes that get voted on are nickle and penny taxes that wouldn't even hurt anyone. I think the state raised the property tax one year with no public vote on it and it was a huge uproar even though we were still the lowest in the nation. As many conservative views I hold, I don't mind paying some taxes that go to things I actually use or are useful like the future's education. Only $400-600 a year.. wow. Thats such a small amount compared to everything I'm used to. My parents would often put $10-$20 a week into the church collection plate every sunday. I mention it because thats over $400 a year and not even close to the 10% of income the catholic church wants people to donate. The churches in your region are probably way more funded than your school system. I agree that I don't mind paying taxes for things that the state needs too that benefits the future, but its hit a saturation point here as far as I'm concerned. The taxes go up every year regardless of the economy and they still don't have enough money to fix the bridges or infrastructure. The school budget here goes up over $1 million dollars a year. Every year without fail. Which causes everyone's taxes to go up about $28 or so a year.. every year. And thats just the school tax. The property taxes keep going up to the point, that after a 30 year mortgage, people won't have the extra cash from paying off a house to actually retire with. Because after 30 years of tax increases, the taxes will be so high that the money that would be saved from not paying a mortgage will now go directly to taxes. People I know get offended when I make comments about food stamps. But working in the grocery business I see first hand how much it's abused. It's become a "live as comfortable as the middle class" system instead of a don't starve system as it was intended to be. I see people with $300 shoes and a iPhone swipe their EBT card and drive off in a SUV. They buy Ribeye steaks, junk food, and then buy beer and a pack of cigarettes with their own money. Basically my tax money pays them to eat better than me so they can have luxury items. That's BS. Yeah some people really need government assistance, but there are a lot of people that game the system, a lot more than people want to believe. I wish ebt worked more like WIC where you could only buy nutritional items. The whole system is costing us way more than it should and needs serious reforms, but right now all that happens is political rhetoric BS about how you want people to starve and die. I think the biggest issue with the ppl you're describing is that they are idiots with their finances. I've been in DSS lines before and I've seen those exact ppl you're talking about. They literally show up to apply for welfare and food stamps with gold chains on, $300 Jordans, the newest iPhone and they never actually buy a car either. It's always a lease of something they could never afford to buy. All their money literally goes to their own personal presentation and lifestyle. And after buying all that crap they have no money for food or rent. 90% of the ppl I've seen like that actually live with their parents or grandparents or with 5 friends in a 2 bedroom apartment because they can't pay bills because "they're poor". They wouldn't be poor if they'd actually live within their means. I really don't understand that lifestyle. Some people would rather spend every last dime they have to try and impress others than to actually improve their lives. Its like they're living an MMO fantasy with fashion wars / jewelry, phone, shoes, and mounts / cars as the endgame. Whenever I see someone looking all flashy I think to myself, damn that guy is struggling hard with life. The more bling someone has the more I assume they're basically living free off of someone else while they spend all their money and potentially the governments money on themselves. I've used food stamps before and I know other ppl now that still use them. At least they're the ppl literally struggling to pay their bills and improve their kids lives but the news will never show the actual kids that are starving at a DSS because if they go there to interview ppl they'll come across all those assholes wearing 10 pounds of gold and chatting on their cell phones. Btw, my bro talked to a time warner rep yesterday. This guy told him the network improvements were because of the charter deal. It had nothing to do with time warner doing good with their customers. It was charter telling them to fully utilize their network because they felt time warner was screwing their customers. Exactly, I have had a few coworkers that actually used them because they needed them. I know people that needed them but have been rejected, so I have no idea how these blinged out people get assistance. It's insane. Alot of the assistance is approved based on the amount of children you have. The more children, the more assistance. I know someone that was rejected because it was just him and his wife and they couldn't manage all the bills with the income he had. But because he had a steady job and they had no children they didn't see him as needing help. The person told him that if they had at least 1 kid with this same income then they'd qualify for every program and would get roughly $1k a month in aid from welfare and food stamps combined. wtf. The system is setup in place to encourage people who can not afford children, to actively go out and have children just to get free money from the government. Compared to part time job at minimum wage, paying $350 a month in insurance (thats how much my plan would roughly cost for 2 adults and 1 kid), and then paying for a babysitter while that person is at their part time job.. its more economically viable to have a kid, quit your job, get on welfare and get free medicaid for the family. The welfare and food stamps combined will pay out more than 2 minimum wage jobs and free health care saves them enough money to pay $350 a month on a giant SUV lease. And as long as at least 1 of the parents works 1 part time job for at least 5 months in a year (enough to file taxes), they'll get earned income credit and child tax credits that pay out far more to them than they'll ever pay in taxes in any given year. Its messed up. (try it in tax software, make a dummy w2 where you make less than $15K, put in 3 children and a spouse and see how those tax credits come rolling in, they live completely tax free. and the welfare and food stamps don't get added in in tax returns since its all tax free too.) The government basically pays impoverished people to reproduce and not work. I had neighbors that played the system. The more I looked into the more I understood how they were working it all. And yeah.. when tax time came around I saw 3 new HD TV empty boxes out on the curb on trash day and some boxes for new bluray players and a game console. Then they'll go out on the first of every month to go grocery shopping. I have to mention this. Its because of people like this there are the proposals of minimum wage getting increased to $15 an hour. $15 an hour is pretty much the minimum anyone will need to be making to no longer quality for welfare and foodstamps and it would actually give people an incentive to actually work because with a full time job, they should be making more than what all the public assistance combined should be paying out. The real question is whether people will actually do the work or if they will just keep working the system. But even then the $15 minimum wage isn't a good idea imo because minimum wage jobs really are supposed to be a stepping stone to a better job. Or is supposed to be initial jobs for america's youth. In NY we're taxed by just about every website there is, but now the rest of the country can enjoy paying taxes for all their online purchases. No real change for amazon tho since they already charge taxes for almost every state anyway. I'm wondering if this could force ebay to collect taxes on every single individual seller's transactions now. Syfy Announces ‘Ringworld’, 'Helix' and more. I'm glad to see that Ronald D. Moore is working with Syfy again. Considering how amazing Battlestar Galactica turned out, I have high expections for Helix. Syfy is finally making more Science Fiction series. They announced multiple new projects to a group of advertisers yesterday at their annual Upfront event. Aside from the highly anticipated Defiance series which will be premiering next Monday, Syfy has been less known for Sci-Fi and has become more focused on wrestling and reality shows. While it does not appear that will be changing, at least they'll be re-embracing the genre that started their network. Here is a list of the new shows with some brief descriptions:. Based on online document leaks from last June and a Microsoft employee spilling the beans about internet requirements for the new system on Twitter a couple days ago, it seems as though the next Xbox console (Xbox 720?) will require an always online internet connection. This online connection would most likely be needed to initially load games and applications in the console. Even though always online connectivity is very common in a large majority of households, this could anger quite a few gamers. I suppose if my internet provider had an issue and my connection dropped out, I'd have to keep myself entertained by playing games on my PC, phone.. or anything other gaming platforms besides Microsoft's new console. Of course, my internet has only gone out once in the past year, so I doubt I'll have any problems. But we'll have to wait until Microsoft officially unveils the new console to see if this is true. Do you think this always online requirement could potentially hurt the new system?